Tim and I hosted a Doney/Wadsworth fiesta tonight. Yes, it is December 20th, and we are celebrating the country south of our border. Why? Because I have about 100 coupons for free tortillas, and I decided to use them. There were 11 people in our two-bedroom apartment, and two of those guests happened to be under the age of 3. Did I mention we have the most unbaby-proofed apartment in the history of mankind? Because we do. All that to say, I'm exhausted. But because I'm middle child, I tend to carry unnecessary guilt and set my expectations too high. It is for this reason that I feel I must blog about these sugar cookies. Tonight. Because someone might need them tomorrow. Combine flour, baking soda and baking powder. Set aside. Add in dry ingredients slowly. Please don't dump it in all at once, unless white is really your color. Drop teaspoonfuls of dough on sprayed pan and bake for 8-10 minutes or until slightly golden brown. You might notice that I did not do normal-shaped cookies. That's because I'm a sucker for my niece and nephew's adorable faces and just had to do the traditional "Christmas cookie-cutting event." If you're pathetic like me, roll out the dough on a floured surface and, using a rolling pin, spread out the dough until it's flat. 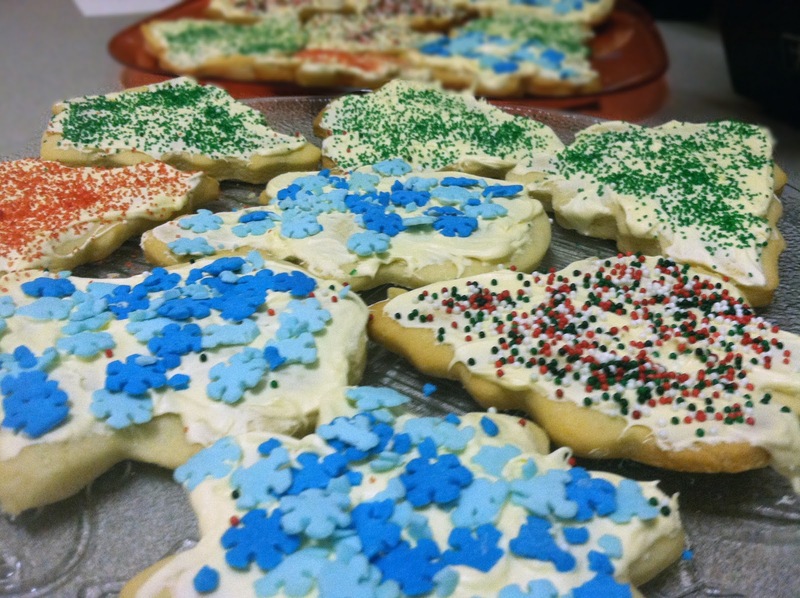 Then cut out the shapes with cookies cutters and bake. Top with frosting and sprinkles. 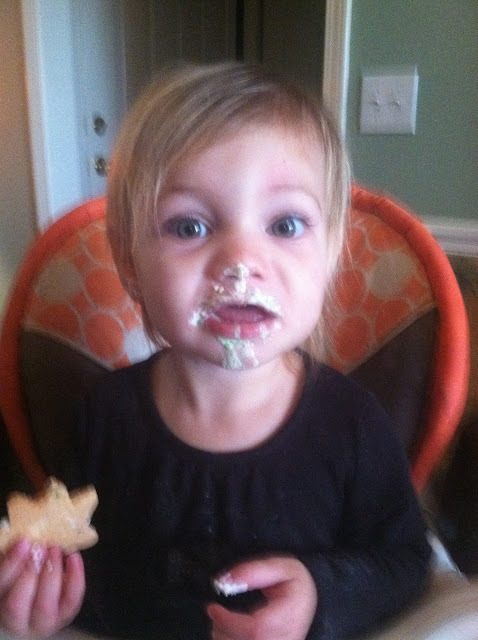 Then kiss the messy faces that eat the frosting by itself. What do you do for the icing? Owen and I are doing sugar cookies tomorrow, and I can't decide what type of frosting to make.